Entered according to Act of Congress June 8th 1866. A puzzling caricature, probably dealing with Reconstruction under Andrew Johnson's administration. The work is quite crudely drawn. An acrobat, with mustache and sideburns and wearing a jester's cap, holds in each hand a mask, one grinning and one frowning. 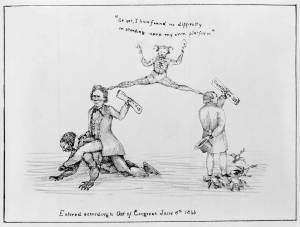 His legs stretch from the head of Pennsylvania congressman Thaddeus Stevens, who holds a paper labeled "Committee of 15" and is seated on a black man, who crawls on all fours, to the head of an unidentified man (probably Johnson) who holds the U.S. Constitution. The latter's back is turned to the viewer and several geese, some alive and some dead, appear at his feet. Stevens, an abolitionist, was one of the most prominent members of the Joint Committee on Reconstruction, composed of fifteen members of Congress. The fool remarks, "As yet, I have found no difficulty in standing upon my own platform."